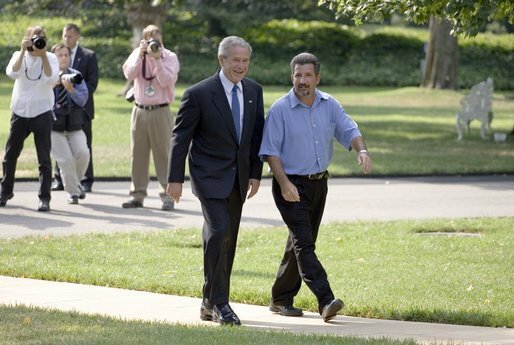 Katrina Survivor Begs Bush to Stay "4 More Years!" Don’t expect to see this lead off the CBS (ABC, NBC,…) evening news tonight! Rocky, from St. Bernard Parish in Louisianna, lost everything in Hurricane Katrina. He drove all the way to the White House to speak with the president personally. MR. VACCARELLA: Thank you, Mr. President. MR. VACCARELLA: It is. You know, it’s really amazing when a small man like me from St. Bernard Parish can meet the President of the United States. The President is a people person. I knew that from the beginning. I was confident that I could meet President Bush. And my mission was very simple. I wanted to thank President Bush for the millions of FEMA trailers that were brought down there. They gave roofs over people’s head. People had the chance to have baths, air condition. We have TV, we have toiletry, we have things that are necessities that we can live upon. But now, I wanted to remind the President that the job’s not done, and he knows that. And I just don’t want the government and President Bush to forget about us. And I just wish the President could have another term in Washington. MR. VACCARELLA: You know, I wish you had another four years, man. If we had this President for another four years, I think we’d be great. But we’re going to move on. Mr. President, it’s been my pleasure.